Today’s episode has a bit of a different feel than my usual ones. I have heard from so many people wanting to know how to use Pinterest to get a new blog off the ground. That’s what we are covering today, and I am excited to share some great ideas with you. My guests on today’s show are Kristie, from Blog Ambitions, and Chrissa, from Physical Kitchness. They have worked diligently over the past year to grow Chrissa’s blog, so we are going to discuss what they did and the results they have seen. Kristie’s business is helping bloggers from before they even begin their blog, throughout the process of blogging. She decided that she wanted to take one specific person, and follow her through the entire first year of her blog. Chrissa submitted an application to be the one, and Kristie immediately fell in love with her style, her personality, and her passion for her content. For her part, Chrissa had wanted to start a health and wellness blog for at least 5 years, but the busyness of life (and just plain old fear) were holding her back. Moving to a new city with a new baby made her realize that starting over in a new office every time they moved was getting old. Fast. She knew that now was the time to see if she could make a go of a blog, and turn it into a business. So what were those fears that were holding Chrissa back? I would say they are the typical fears that most wanna-be bloggers face. She had a huge fear of not being technologically savvy enough to get started, and not being able to maintain the blog once it was up and running. Beautiful graphics and navigation menus on successful blogs she visited were intimidating to Chrissa. Another fear was getting her blog out there in front of people. She had no idea how to get people to actually view it, if she did ever manage to create a blog and figure out graphics. At this point, she considered being able to log off of her computer a success. Sound familiar? Kristie came into the relationship with a strategic launch plan. She and Chrissa worked behind the scenes for nearly 2 months getting things set up and ready to go. Chrissa had a lot of homework to do; the goal was to have her come out swinging. It was important for her to look professional out of the gate so that people would take her seriously and take the blog seriously. Once the blog launched, her social media accounts were already set up, the blog was share-enabled, and she was ready to go public with her posts. 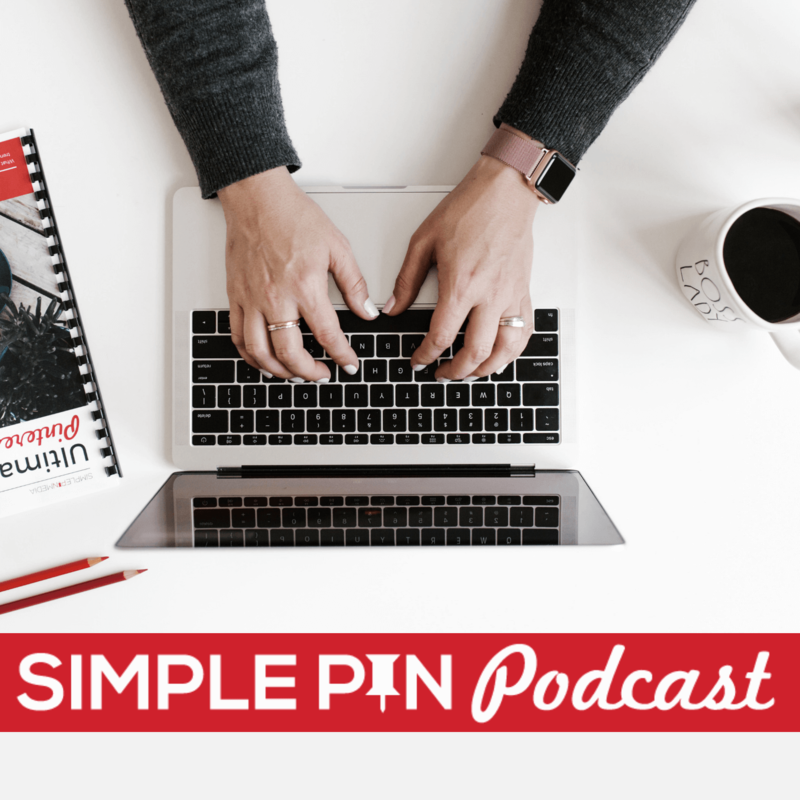 Because Chrissa had been a self proclaimed “pin addict” before starting the blog, she knew that Pinterest would play a huge role in growing her blog. She began using her account as soon as she went public. Chrissa already had over 500 followers, so they transferred her account to a business account, applied for rich pins, and she was good to go. Check out this post to learn more about the value of rich pins. Launching a new blog is stressful in itself, but trying to keep up with “all the things” can be downright overwhelming. It was very important for Kristie to help Chrissa stay focused on what was important. In order to keep the overwhelm to a more manageable level, Kristie had Chrissa complete pre-launch work on her social media channels. One of the ways she did this was by pinning content that was either in her niche or that complimented her niche. Believe it or not, Chrissa even had an email list before she launched! She humbly states that it was all family and friends on her list, but Kristie is quick to point out that it was over 120 people. It was already a nice sized list to launch to. From the very beginning, Kristie encouraged Chrissa to reach out to other bloggers in her niche. She began doing round-up style posts, and sharing those posts on her Pinterest page. But what really helped her Pinterest account take off was when a well-known blogger shared one of Chrissa’s posts on her own page. That pin got over 1,000 repins and gave her a huge traffic spike. Pinning consistently was another strategy that Chrissa used from the beginning. That wasn’t difficult for this Pinterest “addict”. She pinned her own content, as well as content from others in her niche. Chrissa did only live pinning for the first six months after her launch. But she kept hearing that using a scheduler is the key to seeing your Pinterest numbers take off. The thing was, she didn’t want to spend the money for a scheduling tool because she wasn’t making any money at the time. She finally decided to bite the bullet and try it. So she signed up a free trial with Tailwind, and she saw a difference almost immediately. Because Tailwind pushes pins out at the ideal times, she gained many more repins by using this tool. In the end, investing in Tailwind turned out to be the thing that sent her Pinterest sky-high. She went from a few hundred hits per day, to thousands. In 18 months, Chrissa has gone from just over 500 followers on Pinterest to over 21,000! And Pinterest accounts for 50% of her blog traffic. Chrissa had to learn a lot about photography in order to create gorgeous pins; and she had to figure out what her pins should look like. This all took time to perfect, but now she knows what her audience likes and she can deliver that with every pin. Every blogger has to do the work to get better at creating images, and this was also true for Chrissa. She began on Canva, but her choice of fonts was limited. And the idea of branding without that consistency was making it difficult. When Chrissa switched to BeFunky, she was able to brand her images with not only fonts and colors, but also with a watermark and an icon. In her opinion, this tool is one of the best free options there is for editing and creating graphics. Scroll down to the bottom of this page to see links to several photography courses that Kristie recommends. There is even one strictly for cell phones! Nail down your brand’s colors/visuals. What are you drawn to? Brights? Neutrals? What kind of mood are you wanting to set? Nail down your niche. Who is your target market? Is it moms? Is it foodies? Stick with it. Pinterest is slow moving, so you have to be patient. Do things the right way from the beginning. All those Pinterest strategies are strategies for a reason. Use great descriptions, use keywords, have rich pins enabled. Focus on one platform at a time. With so many social media platforms to choose from, you might feel like you need to be everywhere all at once. But you don’t. Start with one, learn it, and grow from there. Sometimes Pinterest can feel like “the daily grind”; you don’t often get immediate feedback. You have to watch it over the long haul; you won’t reap what you sow for a while. But if you are willing to be patient and continue to invest in it, you WILL eventually see the fruit of your labor! Are you in the process of growing a new Pinterest account? What have you learned along your journey? Share in the comments below. Such great information here! I’m currently trying to grow my Pinterest account so any advice helps! Thanks so much for listening and I’m so glad you found some great tips! Try it!!! It’s so easy to use and if you find yourself in a pickle we have a Tailwind course. I so badly want to figure this out but I am just not a great learner if it’s by reading. I can read things over and over and it still swims in my head and I take no leap. I may have to consider hiring a coach who can help teach me the way I learn. I’m trying to retain these tips though! Thanks- I am new to blogging and still struggling with how to make Pinterest work for me so I appreciated the info on what worked and your timeline. Glad you found some great tips and thanks for listening. Great interview with great info! Pinterest is such an amazing resource for bloggers and businesses. This is great, thank you! I have been struggling with my Pinterest a lot… I need to find my brand and stick with it for sure. I have been trying to do the same on all types of social media. It is hard to always be consistent, especially when sometimes I use an iphone for photos, sometimes my DSLR and there is a huge difference in the vibe I produce between the two, but I don’t always have my camera on me! You’re welcome! Hoping you find your branding soon. If you need more help make sure you join my Facebook group. This is super helpful and motivating! I’ve been using board booster – do you happen to have any insight on Tailwind vs board booster? I’d love to hear if so! Thank you for sharing! this is such a great post! I’m bookmarking this one! Pinterest is the one Social Media form that I struggle with the most. I’ve taken online courses and read up on how to utilize it best but I still cannot get it to work for my blogging. Still, I’m determined to get there! Love this post. Thank you!! As a new blogger, I need so much of this information as well as encouragement because you are right that the beginning is overwhelming. Isn’t it!!! Oh my I even felt that and most of my business is client based. But this blog side is tough. Consider the workshops. It’s more hands on. Amazing experience shared by Chrissa, Now-a-days, due to massive popularity of Pinterest – it has high impact on online businesses but you only need to apply strategies in positive direction for positive results in minimum time. From my opinion Pinterest is boon for blogger to maximize productivity level. Thanks for sharing. Very inspirational episode! One thing I would love to hear / learn more about is how visual artists who don’t blog can use Pinterest to grow their business. I joined Pinterest back when you needed an invitation to join and used it on a personal basis, but eventually converted it into a business account. I pin images from my online print store, and I do get some traffic from Pinterest but no sales. Great idea! I’ll do some digging. I definitely haven’t utilized Pinterest to it’s fullest potential for me to grow my blog. This is inspiring me to take some time to do it! You really should! It’s not instant like Facebook or community building like Instagram, but it’s great for long-term traffic. If you need more help, I’m hosting this now. This is so timely for me! I just launched my blog last month and I have zero traffic, lol! Thanks so much for the help! love this!I listened to the whole thing front to back. SO much great information and tips. I cant wait to apply the advice to my pinterest account. I have had a blog for about 3 months.. and I really needed this to get me motivated to keep on keeping on! Thanks for an excellent list and a very helpful resource! Great post, really appreciated! A lot of advance tips published here that I’ll definitely keep in mind for the growth of any pinterest account.